As your business grows often your customer database becomes so large it can seem uncontrollable. You need a tool to store all your client interaction data and follow up on prospective contacts. 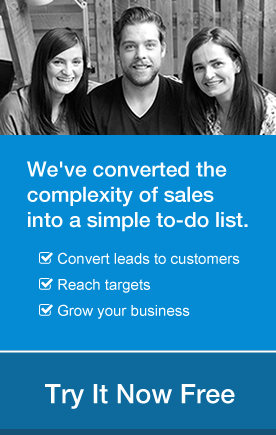 Get to know OnePageCRM, the simple CRM, built for salespeople. OnePageCRM is a web-based CRM software, specifically designed to help salespeople store their customer information and effectively follow up on every single contact. This is a simple tool your company can start using in minutes. The best thing about it is its user experience and intuitive interface. All the information you need to add and view is presented on one rich user experience screen. Your data is always secure, and backups are made nightly. Oftentimes, what you really need, you can no longer find or access. Not so with OnePageCRM. It’s all there for you to see. By keeping everything on ‘one page’, it provides salespeople with all the critical information they require to focus on sales. By encouraging everyday usage (our Action reminder email arrives in your inbox at 7.30 each morning! ), OnePageCRM helps bring every contact forward towards a sale without painstaking digging through administrative data. The OnePageCRM system encourages users to make upfront decisions and set future sales actions for each contact. This ensures that leads and prospects never fall between the cracks, but are constantly being moved through the sales process to a successful win. 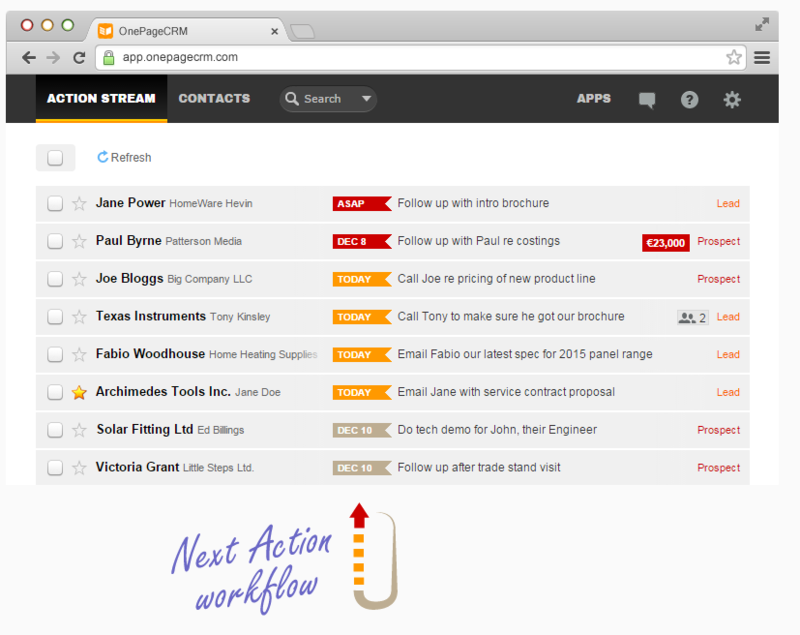 Just a quick look at your Action Stream, and each contact will be there, letting you know what to do for them next. By organizing your contacts, OnePageCRM becomes your best time-management tool. No more wondering what needs to be done today or tomorrow. Classify the deal, get a timeframe for the deal and then be able to do forecasting based on that data (all in one easy-to-access window). Manage groups of contacts, and drill down to what works for them through the tagging feature. Customize your tags for each group of your clients. Your business will love you for it. Easily filter your contacts based on a set of criteria, for example, just leads and prospects from a certain region, or customers with a certain tag. Pull in existing client data directly into OnePageCRM from a spreadsheet or Google Contacts. However, you can also send your data to OnePageCRM support team and they will import it for you. It’s easy to export all or part of contacts in case you need, for example, to conduct an email marketing campaign. OnePageCRM is integrated with some of the best cloud applications on the market. Send out targeted email campaigns to contacts in the CRM, via Mailchimp and store a record of invoices from successful sales using our integration with Xero. For more information on creating your sales ecosystem with OnePageCRM, click here. OnePageCRM offers full functionality at a standard price from day 1, with no ”surprise” opt-in’s later on in the funnel. At $12 per user per month, and a month’s discount when paid by annual subscription; OnePageCRM stands as one of the most affordable and effective systems on the market. 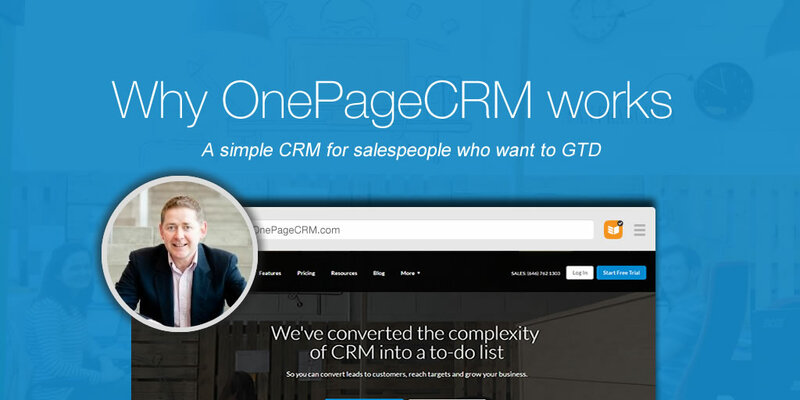 In a nutshell, OnePageCRM is the best CRM built for salespeople. It encourages the user spend more time selling, with a built in follow-up system that works. Using a dynamic list of contacts, OnePageCRM helps move prospects and customers through the sales funnel forward towards a sale.